The Seleucid Empire was a Hellenistic state ruled by the Seleucid dynasty, which existed from 312 BC to 63 BC; it was founded by Seleucus I Nicator following the division of the Macedonian empire vastly expanded by Alexander the Great. The Seleucid Empire was a major center of Hellenistic culture that maintained the preeminence of Greek customs where a Greek political elite dominated, mostly in the urban areas. The Greek population of the cities who formed the dominant elite were reinforced by immigration from Greece. The Seleucid Empire eventually clashed with the Roman Republic, and following a series of defeats was reduced to a minor state around the capital of Antioch. 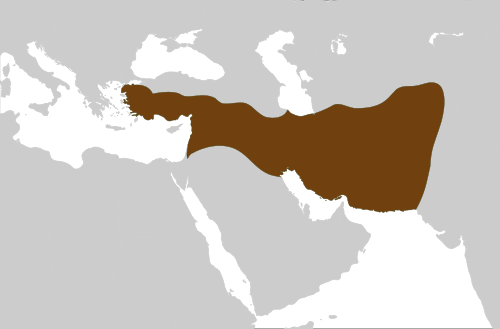 By 63 BC, Pompey the Great did away with the sad remains and created the Roman province of Syria instead. Ref: SC 146; ESM 46; SNG Spaer 135.